2015 Summer Solstice “rose” pattern in Uffcott, Wiltshire, U.K.
A 2015 Summer Solstice “rose,” June 21, 2015, appeared in a wheat farm in Uffcott, Wiltshire, southwest of Swindon, England. Aerial image © 2015 by Lucy Pringle. Uffcott is marked by Google pointer about 5 miles southwest of Swindon, Wiltshire, England. 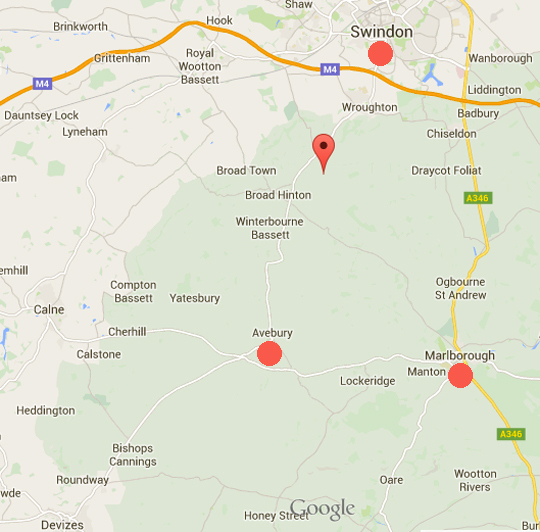 At the center of the map is the ancient double stone circles of Avebury and nearby Silbury Hill. 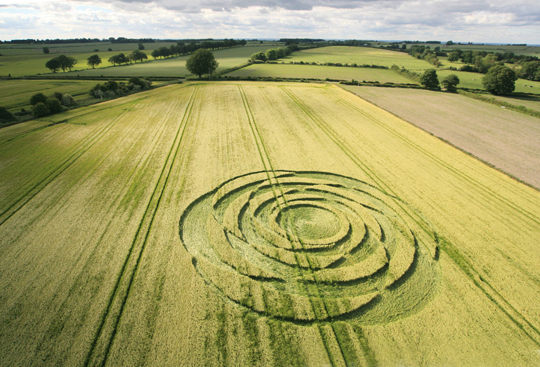 August 28, 2015 - Wiltshire, England - Long-time Wiltshire crop formation researcher Charles Mallett is also producer of the crop circle website Silent Circle.com (See Websites below). In one of his reports on August 3, 2015, he has video interviews of a Spanish tourist describing "Tornadoes and Weird Energy Barrier at Uffcott 'Rose' Crop Circle Site."